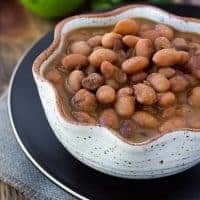 Slow-Cooker Mexican Pinto Beans! Easy to make and perfect for your Taco nights. These will be a family favorite recipe! The night before, place the pinto beans in a bowl and cover with water. The water should be a few inches above the beans as they will absorb water. The next day, drain and rinse the pinto beans. Add the remaining ingredients to the slow-cooker and stir to combine. Cook on low for 6-8 hours. Remove the onion and jalapeno halves and season to taste before serving. Enjoy!